Webfoot Trucking, a local trucking business, worked with us to utilize the Energy Trust of Oregon to earn an energy rebate. We switched the lighting to electronic ballast and the new T8 lamps. The ROI (return on investment) is 1.5 years. Click here to see more images and information. 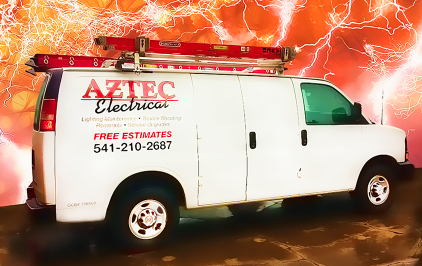 Aztec Electrical is a full service electrical contractor, serving Jackson County and Josephine County, that provides residential services and commercial services. We are a certified electrical contractor with the Energy Trust of Oregon.